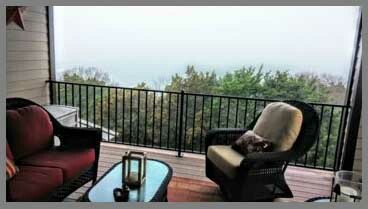 This is a photo from my deck, however, since we were fogged in this morning you can’t see the view. This is the same picture from my deck after the fog lifted. There’s a lot more to see, but you can’t see it all. You have to trust me when I tell you that between the near trees and the far trees there’s a valley and a golf course. Just because we can’t see things, doesn’t mean they aren’t there. Much of life is like this. There is much that is hidden, and what is hidden, is hidden for a reason. What is revealed is what God wants us to see and act on. We don’t know what we don’t know and we can’t see what we can’t see, and sometimes that’s a good thing. It’s probably a good thing that we don’t know the betrayals, deceptions, broken hearts, illnesses, devastations and destructions of the future. We can’t see all the suffering that God will allow into our lives. Sometimes, though, we fear the unknown and that fear can paralyze us, keeping us from wholeheartedly following God and doing what he asks us to do. Perhaps what we fear most is that we don’t know what the outcome of our obedience will be. Perhaps we’re afraid of other people’s responses and reactions – that we might be persecuted, excluded, teased, shunned or rejected. Imagine if God told us what the outcome of our obedience would be. We would quickly rush out to complete the tasks that would be received with joy, or that would provide accolades for us. We would shirk from the things that wouldn’t make us happy. What God does do is reveal himself to us so that we know he is trustworthy and faithful and that he always has a purpose in what he asks us to do. That revelation must be sufficient to enable us to obey. So why is it so hard to obey, to step outside of our comfort zone, to go where he tells us to go and say what he tells us to say? If we knew in advance what the consequences of our disobedience would be, perhaps we would more readily obey. We are not told how things will turn out, we are simply called to follow Jesus wholeheartedly. We do know what that kind of wholehearted commitment looks like. We see it in Abraham when he was asked to leave everything familiar, in Esther when she risked her life to stand before the king, in Paul when he was imprisoned, in Jesus when he left heaven to die on the cross. Are we afraid of leaving what is familiar, of speaking up, of wholehearted surrender because we do know the cost; and it is more than we are willing to pay? Is it that we don’t want to surrender control of what we know, in order to trust God with what we don’t know, because that is simply too much to ask of us? Are we afraid to lay down our will and take up God’s, because we don’t know what it is like to experience God’s complete under-girding, sufficient grace, and therefore we let fear stop us in our tracks? Fear is not a bad thing, it keeps us from rushing headlong into dangerous territory, but when we are more afraid of the unknown than we are of wholeheartedly following God that is a dangerous fear. When fear of the unknown or unseen, keeps us from acting on what we do know about God, that is a paralyzing fear. God shows us enough about himself to know that we can trust him. He has shown us that he is entirely faithful. He will never let us down. However, in order to personally know this, we must experience it. That means we must make a choice to do what God is asking us to do, to die to the selfish excuses that keep our feet planted in fear, and step out in faith. He will be there to uphold us, just as he promises. As we trust in God’s sufficient grace we are able to overcome the fear of what we cannot see and what we do not know. Will you trust God that the things he has revealed to you about himself are sufficient to sustain you as you step out in obedient faith? Will you trust that God knows, and is completely sovereign over, the things you cannot see?